For as long as you’ve worked in a company, you know that information gets passed around every single day. Important information usually come in the form of documents and they can talk about things such as company policies and procedures, orders and requisitions, or even employee terminations. However, if one were to receive these types of important documents, it’s important to send a letter stating that these things have been received. This is the reason why there are acknowledgement letters that one can make to help notify management and human resources that these important documents have been received and understood. What is a training acknowledgement letter? This is a type of document that states everything that was involved in a particular training session as well as a form of assurance that a person was able to attend the session and completing all the modules he or she was tasked to take during the entire duration of the training. 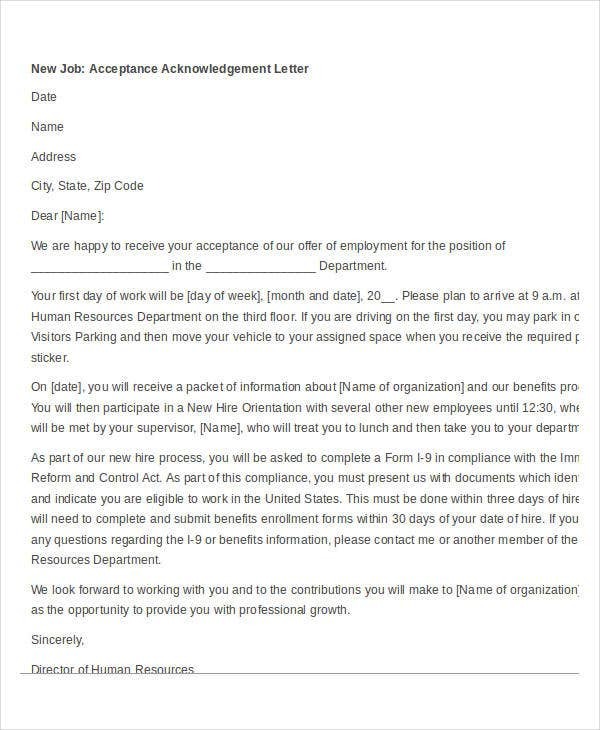 Training acknowledgement letters are very useful for those employers who need to know if probationary employees have completed their training. What should be in a training completion acknowledgement letter? Why do employers need training acknowledgement letters? It serves as evidence that an employee was able to take part in the training session, as well as complete it. So if you’re an employer, you can pull this document up from your employee records if you need proof that a worker has finished the training he or she was required to undertake. 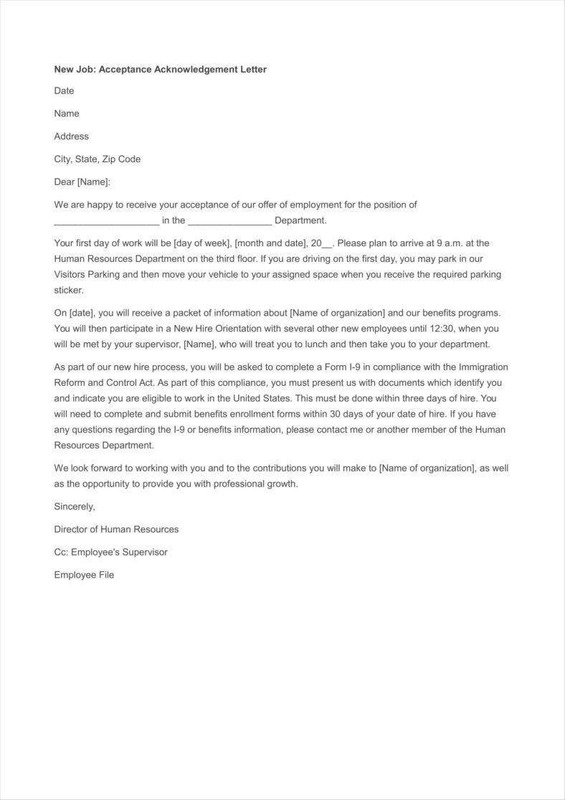 This acknowledgement letter can help show the supervisors of these employees in the event that there are any absences that were incurred due to the training sessions provided by the company. This can help prevent any issues regarding attendance. It’s a document that can be added to the employee’s profile especially if it’s the type of employee training that’s related to the employee’s work function and expertise. Basically, this will make an employee’s personal profile look even better as it shows that he or she was able to take part in and complete training that’s necessary to develop the right skills and abilities needed in his or her field. What is a safety training acknowledgement letter? There are a lot of companies that require their employees to attend safety training programs so that they are able to know what to do should there be any safety-related incidents within the office. Safety training acknowledgement letters act as a form of safety report wherein it helps assure an employer that those who have attended the safety training were able to learn everything that was taught regarding safety rules and regulations needed for their profession. Remember that safety should always be a priority. So if you’re a manager or a business owner, you need this type of letter to help tell you that your employees know the dangers of the workplace and the best methods for avoiding them. 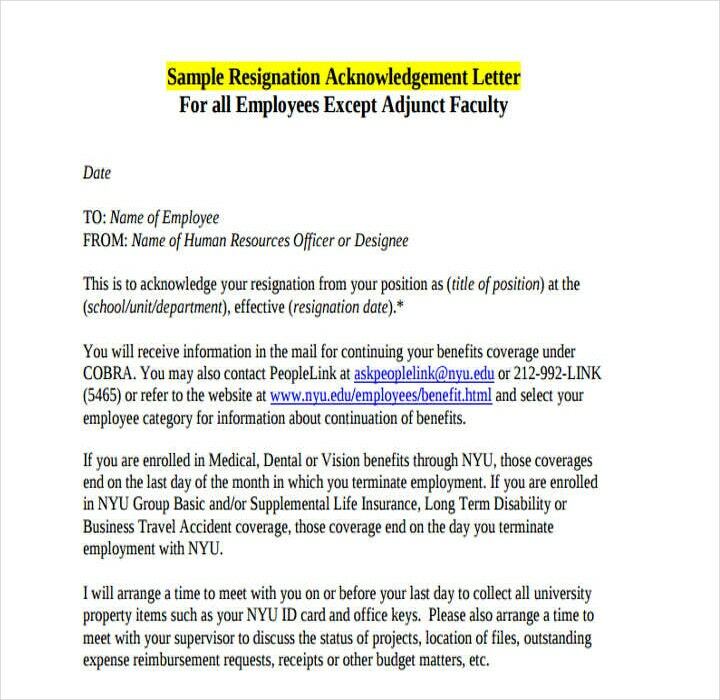 What is a resignation acknowledgement letter? There will always be a point where a company will have employees who are going to hand out different reasons as to why they wish to leave the company. So if an employer were to receive a resignation letter, check its contents, verify the employee’s reason to leave as acceptable, then he or she will have to send a resignation acknowledgement letter. 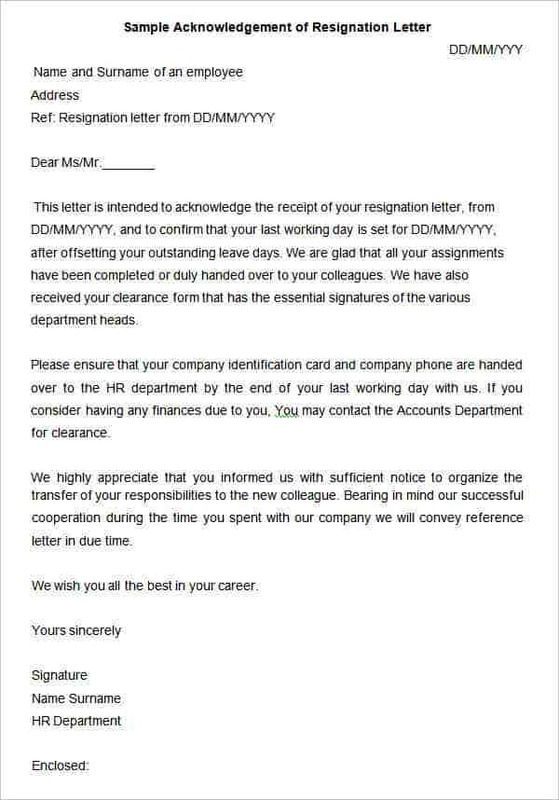 This type of letter is what’s sent to the resigning employee as a way of saying that the resignation letter has been received, as well as the information it contains and that it has been thoroughly read and understood. 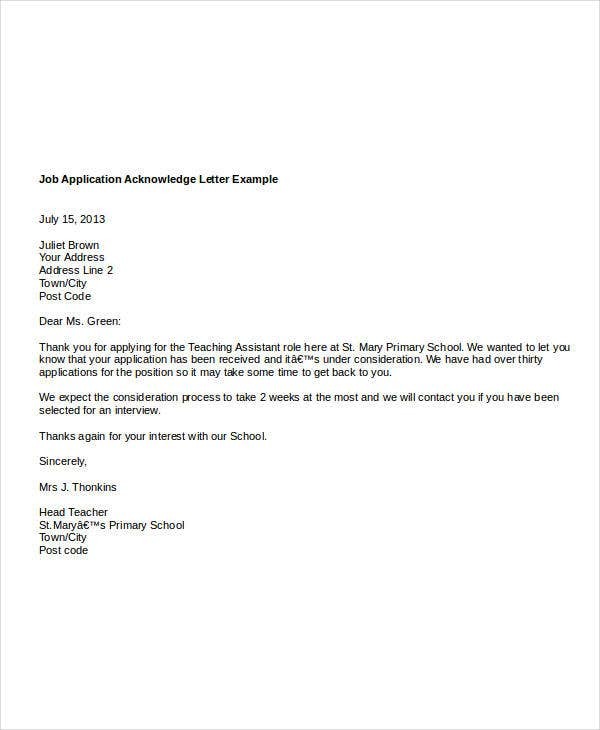 Make sure that the letter follows the business letter format. 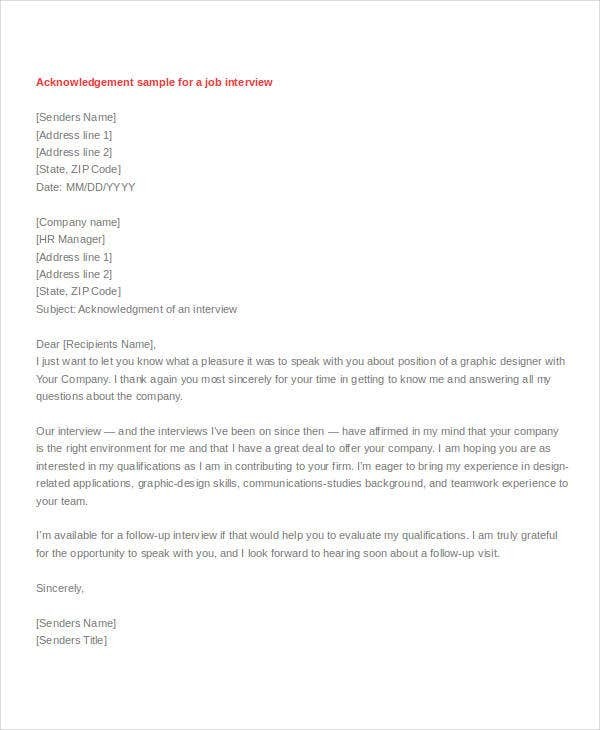 You’ll want to make sure that this type of acknowledgement letter is made to look as professional as possible. 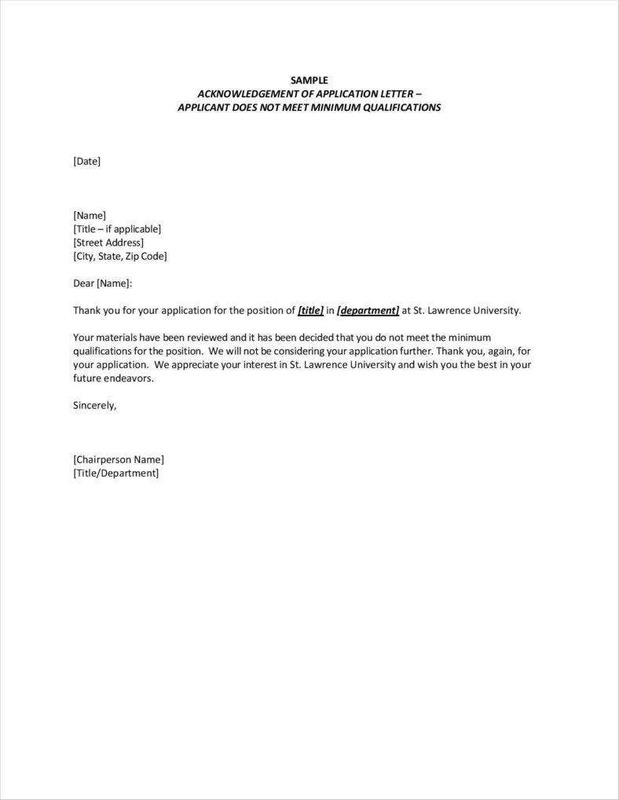 So when using the business letter format, the first step would be for you to place the employee’s, as well as your own, contact information on the top left corner of the letter. 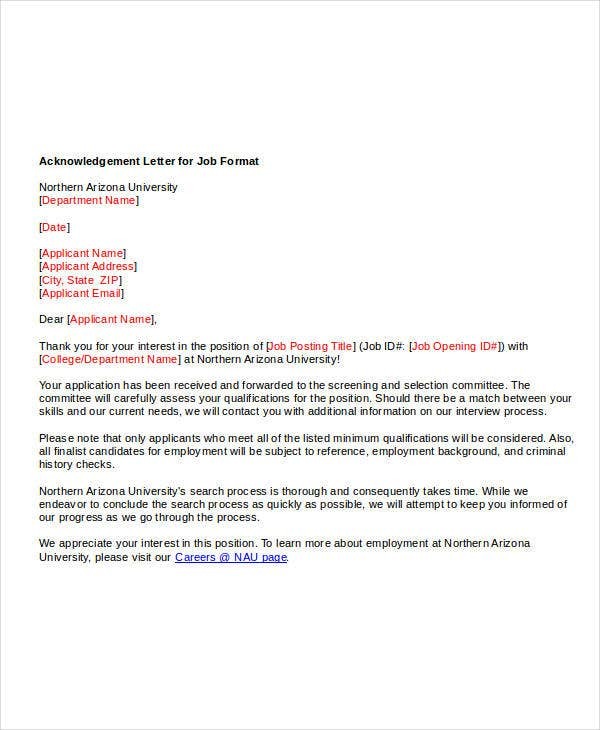 Once that’s done, you’ll have to place your signature on the bottom portion of the letter and then place your name right below your signature. 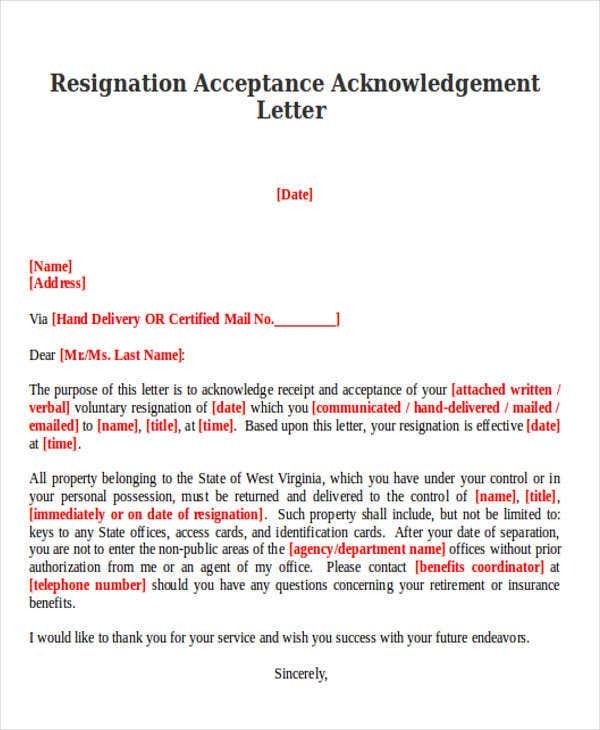 Show your employee that you have accepted the resignation letter. This should be written in the body portion of the letter. 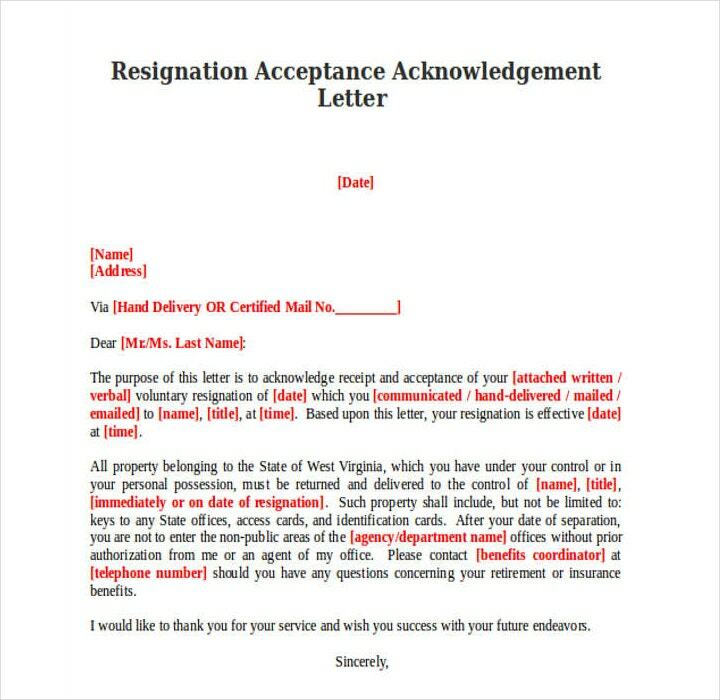 You have to write about receiving the resignation letter, as well as state that you have accepted it. Next would be for you to include the employee’s final date of employment with your company. 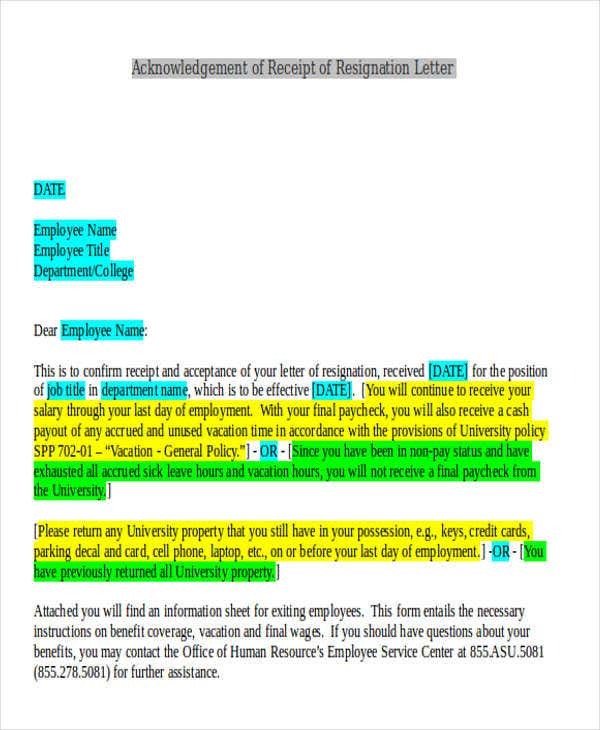 Be sure that this information is written in the letter as this will be documented in the employee’s records. Who knows? It may just come in handy for future situations regarding the employee that’s leaving. Express that you’re able to understand the reason or reasons regarding why the employee has to leave. It’s never a great thing to know that you have an employee that’s going to leave, especially if it’s someone that was of great value to the company. However, you still have to show that you’ve accepted the employee’s decision to go, whether you like it or not. So as you’re writing the response, indicate that you regret the loss, but that you respect and understand why the employee is resigning. You can even go so far as to provide the employee with assistance during his or her transition of leaving the company. 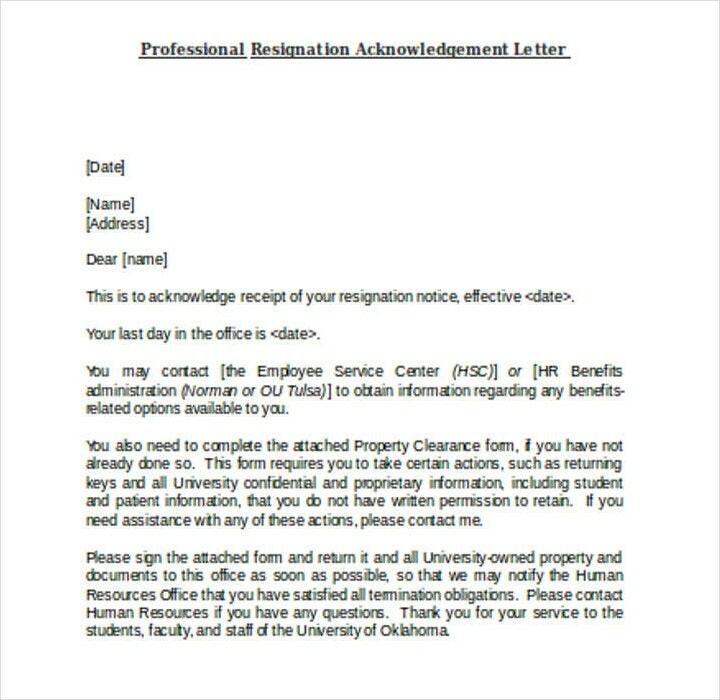 Be sure that you have a copy of the resignation acknowledgement letter before you send it to the resigning employee. The reason for this is because there might be situations wherein you are going to have to need this document. A good example would be a returning employee who would like to reclaim his or her old position in the company. 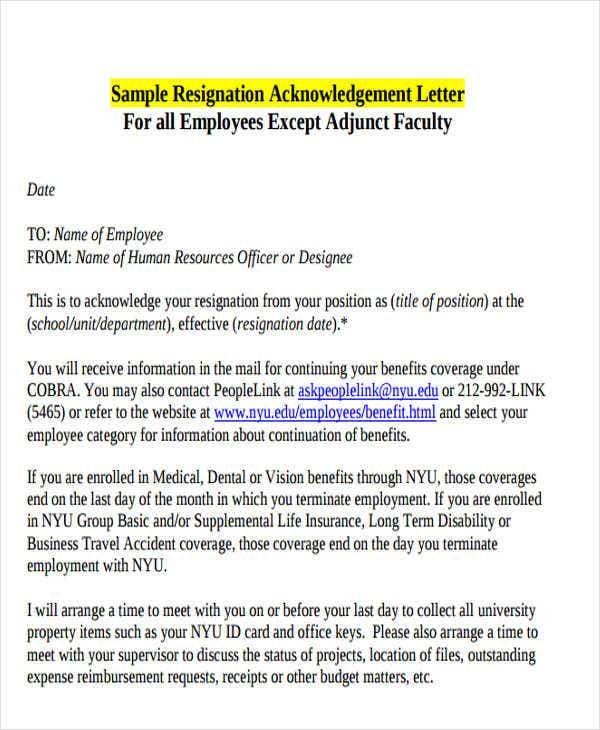 Pulling up the letter can help show whether the employee left the company on good terms. So you have the choice of either saving the copy on your personal file, or submitting it to Human Resources so that they will have the responsibility of placing it in the company’s records. 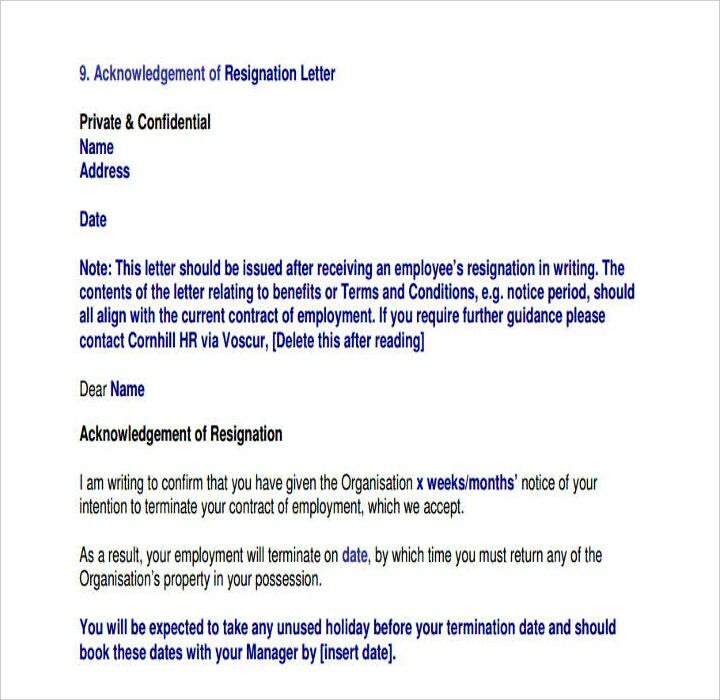 As an employer, you’r going to have to develop a system that allows you to better handle receiving employee resignation letters. So in the event that an employee does wish to resign, he or she would go to you to ask about the procedures regarding the transition out of the company. Doing so will help the employee guarantee that everything would go smoothly with no problems whatsoever. So you’re going to have to provide the employee with professional advice, as well as a detailed outline of structure regarding things like leave notice requirements, the employee’s final date of employment, and even severance packages. Determine if you should make a counter offer. There are two types of employees that are going to leave your company: ones that aren’t exactly valuable to your and your business, and ones that could have possibly led to your business’ future success. So if you see that the resigning employee is one of the latter, then you can make a counter offer in the hopes that he or she is willing to stay. 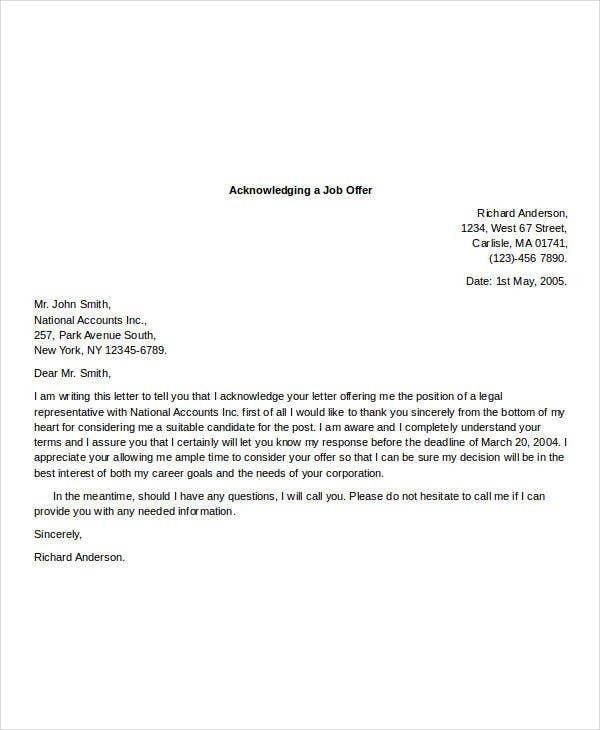 However, if the employee doesn’t accept it, then you will have no choice but to create and state in your acknowledgement letter that you regret the loss as well as accept the decision. Just remember to retain a professional tone all throughout the letter. It is very important that you protect all confidential business information that could harm your company if given to the wrong hands. If the employee that’s about to leave has access to things such as laptops, credit cards, electronic devices, or any other type of company property, then you have to make sure that you take back every single one of them. So create a letter which asks that the employee return the property, then eliminate any and every means of access to devices such as credit cards. You must also change the employee’s log-in info so that he or she will no longer be able to access any information regarding the company that could be used against you. 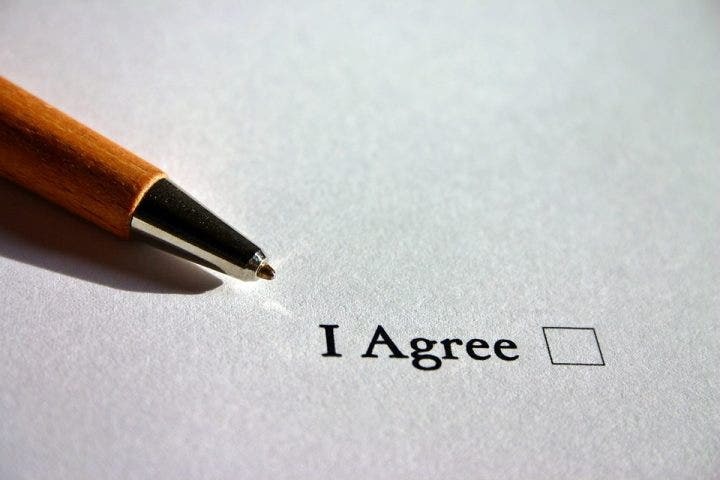 If the employee was made to sign a non-compete agreement contract from when he or she was initially employed, then be sure that you and the employee go over it once you’ve received the resignation letter. Doing this will ensure that the employee knows his or her limitations, as well as the consequences should the employee try to share or make use of any confidential information upon leaving the company. Be sure that the employee wraps up all of the current projects before he or she leaves the company. Allowing the employee to just leave the company without finishing projects that have already started will just end up with you and your other employees having to deal with more work than necessary. So tell the employee to do what he or she can to finish everything before the final date of employment. However, in the event that the employee isn’t able to finish whatever task or project he or she is currently undertaking, then ask for something like a project report that’s able to outline what has already been done and what has yet to be done. You must instruct the employee to provide a list of all the important information that his or her replacement will need in order to take over the position. Basically, you’re telling the employee what you’re expecting before he or she leaves the company. Establish the date of when the employee may be able to leave the company. Usually, Human Resources would require that the employee should give at least two weeks’ notice before the employee can leave the company. Depending on the amount of workload the employee has, you may or may not want to extend the deadline the employee has. You have to know that the higher the position of the employee in your company, the more responsibilities that he or she has. And more responsibilities means that it’s going to take more time to actually complete all unfinished projects and activities. 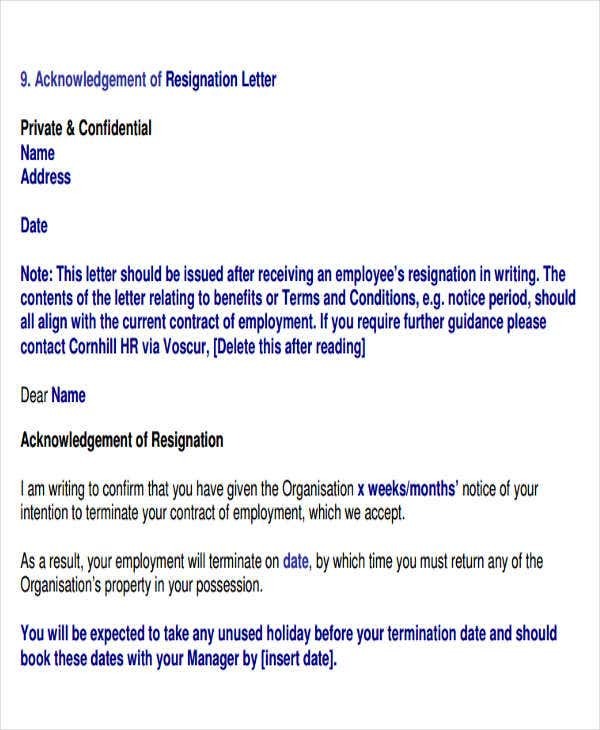 So make sure that you get a resignation notice that contains an agreeable amount of time before the employee may leave. Try to find a replacement that’s able to take over the position being left behind by the resigning employee. 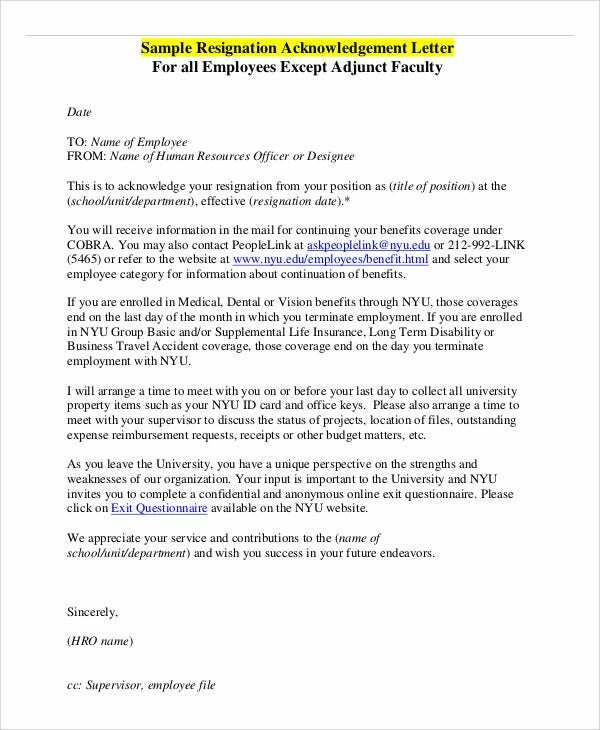 Since you have already accepted that the employee will no longer be working for you and your company, you’re going to to have to start the replacement process immediately. The first thing you’ll have to do is to go over all of your company’s current staff to see if there’s anyone who has the capabilities as well as the qualifications that will determine whether he or she is going to be able to handle the responsibilities and tasks that were left by the previous employee. You may even ask the resigning employee who he or he feels would be the perfect candidate to take the position. If there is nobody in the company that you feel is qualified enough, then you may start the hiring process wherein you will be taking on external candidates. 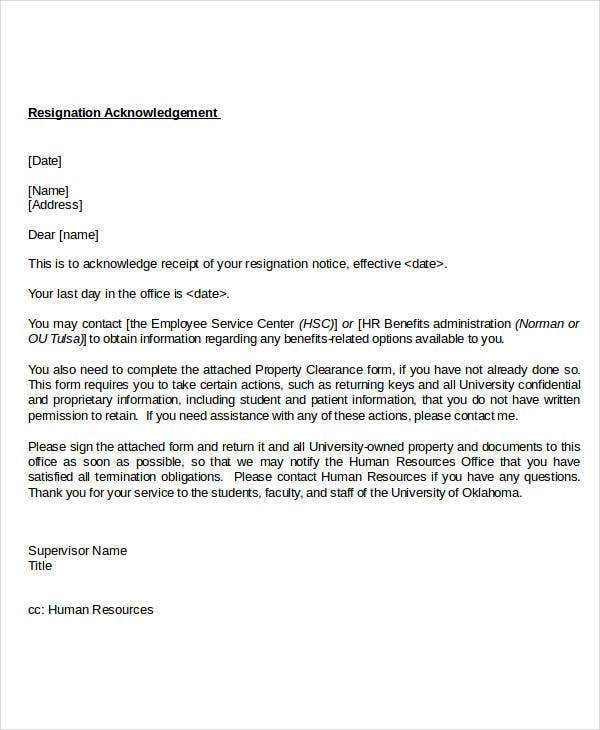 So long as you do these steps, then you can guarantee that hole left by the resigning employee will be filled by someone that’s equally capable. The last step would be for you to conduct an exit interview. Before you say goodbye to the employee, then it’s best that you get as much information regarding his or her experience working for your company. This way, you’ll be able to know how your employee felt, as well as all the possible problems that your company has. With this information, you’ll be able to fix all of these issues that could have possibly made the employee want to leave, as well as make sure that the replacement won’t be encountering them. So it’s best that you encourage the departing employee to be as honest as possible. So when you and your employee are discussing these things during the exit interview, you’re going to have to listen carefully so that you can identify the type of replacement that your company needs, as well as adjust your expectations so that the candidate for replacement is willing to take over the position. The first thing that you’re going to have to do is to create a letterhead that’s able to convey a professional image of you and your company. If you do not have any professional stationery, then you may create the letterhead from scratch and place the name of your company at the top-center of the page. The next thing for you to do is to place information such as the company’s address, phone number, and web address right below the company’s name in a smaller font. Next, you need to address the letter to the proper contact person by placing his or her name in the letter. You must also include the names of any other parties that are taking part in the transaction. 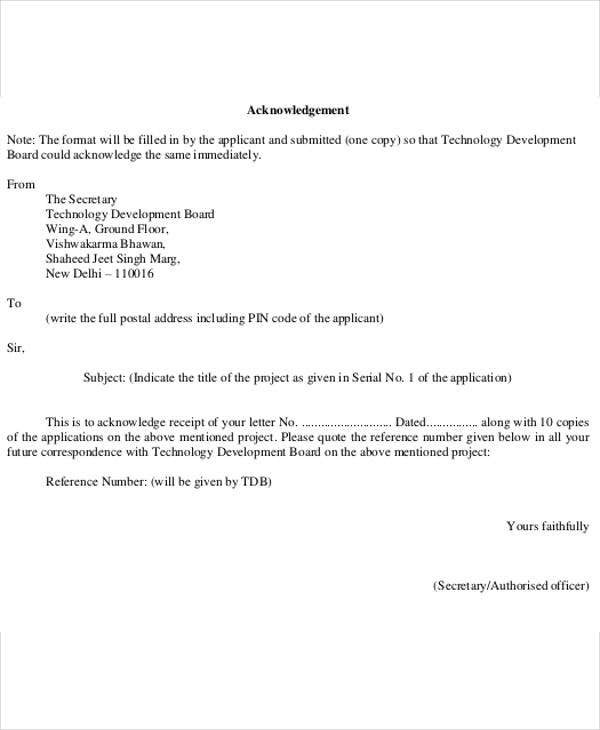 Open up the letter by stating that you have acknowledged the receipt of the document. You can refer to the document through either it’s name or title and then you’re going to have to include the date in which the letter was made. Be as specific as possible when writing down this information as not doing so will just end up with the reader being confused. You wouldn’t want the reader to mistake the document for another type now, would you? In your letter, you’re going to have to explain the next step in the process. In the event that the document has to be reviewed by any legal counsel to clarify the next step, you have to place the date of when the review has to be completed. If the document has to be signed by a third party, then be sure to specify who this third party is by writing down the name. 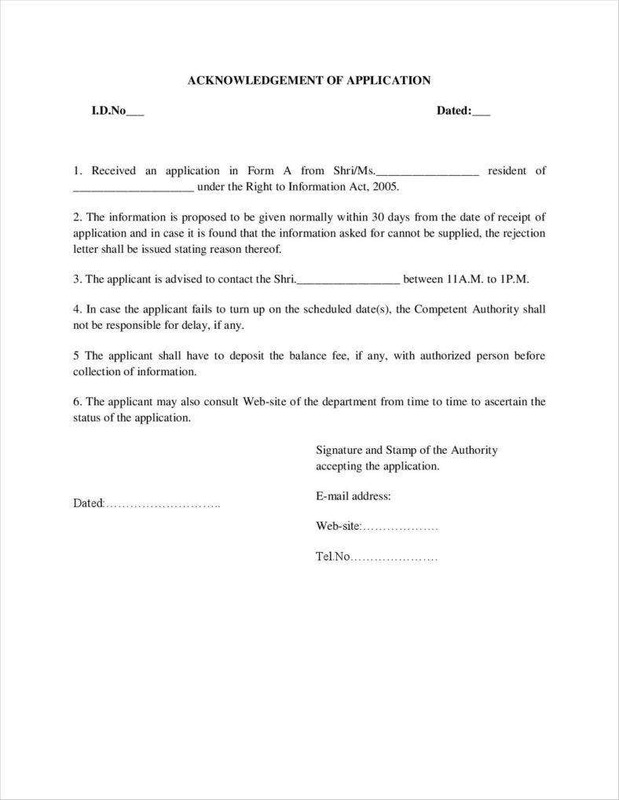 Then place the date of when the document should be returned. Encourage the recipient of the letter to contact you in the event that he or she has any questions regarding the document or the process that’s taking place. Provide the days that it’s best to contact you and when you’re available so that you aren’t interrupted during the most inopportune moments. Acknowledge your relationship with the recipient in a positive manner. One of the best ways of doing this is by saying something like “I’m looking forward” to continuing your “mutually beneficial” relationship. This way, you show the recipient that you’re more than happy to continue doing business with them so long as the two of you are able to gain anything from it. 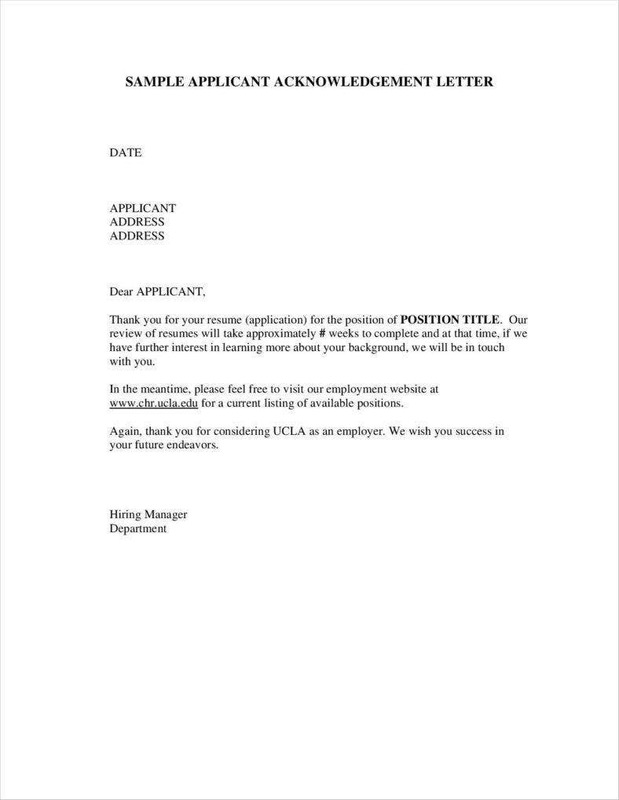 Choose the best formal closing for your receipt acknowledgement letter. A good way of doing so is for you to end it with “Sincerely”, followed by your complete name. Then once you’ve written down your complete name, provide your signature above it. 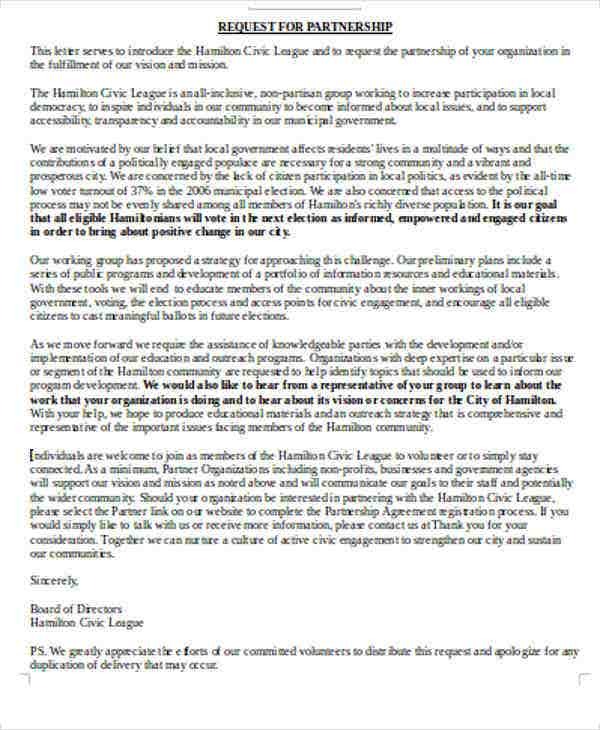 This will show that you’re trying to make this letter as professional as possible. After you’ve done all of this, then you may now proofread and edit the letter to help you find any possible grammar or spelling errors. 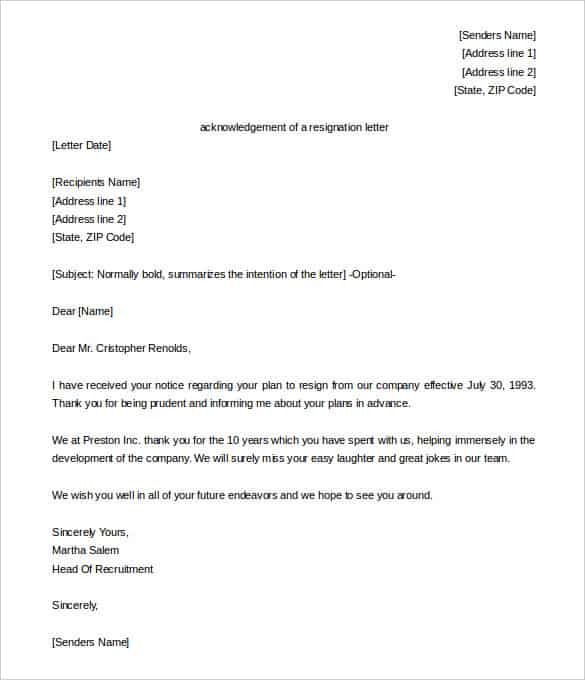 This way, you’ll guarantee that your letter is the type to show that you and your company plan on handling situations like this in a proper and professional manner. Visa application acknowledgement letters are written by those in the immigration department for when they have confirmed that they have received all of the necessary documents that need to be submitted by someone who is applying for a visa. Just because you’ve received this type of letter does not mean that you’re already applicable for a visa or that you’ve already been approved for one. It just contains a list of procedures regarding how you should go about the process of getting your visa approved, as well as the expected date of when you can expect the results of your visa application to be handed out. 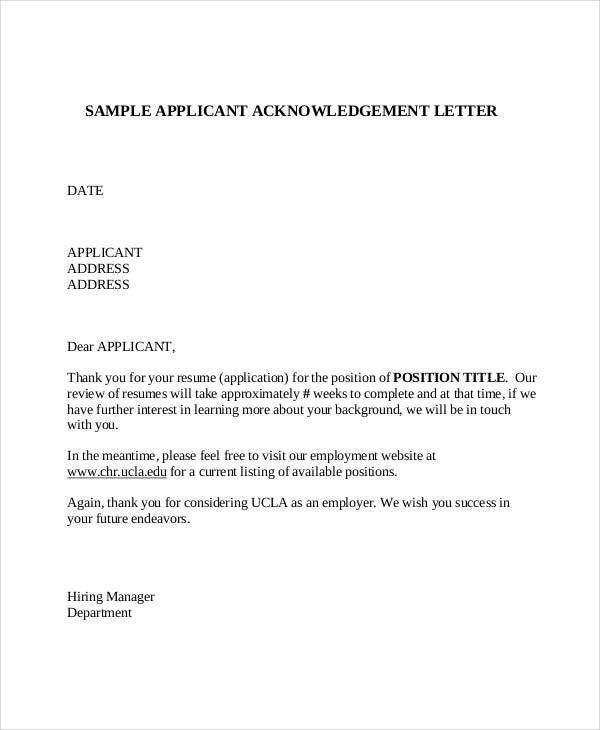 Scholarship application acknowledgement letters are written by those who are in charge of any educational institution for when they have to assure a student that his or her documents for a scholarship grant have been received. 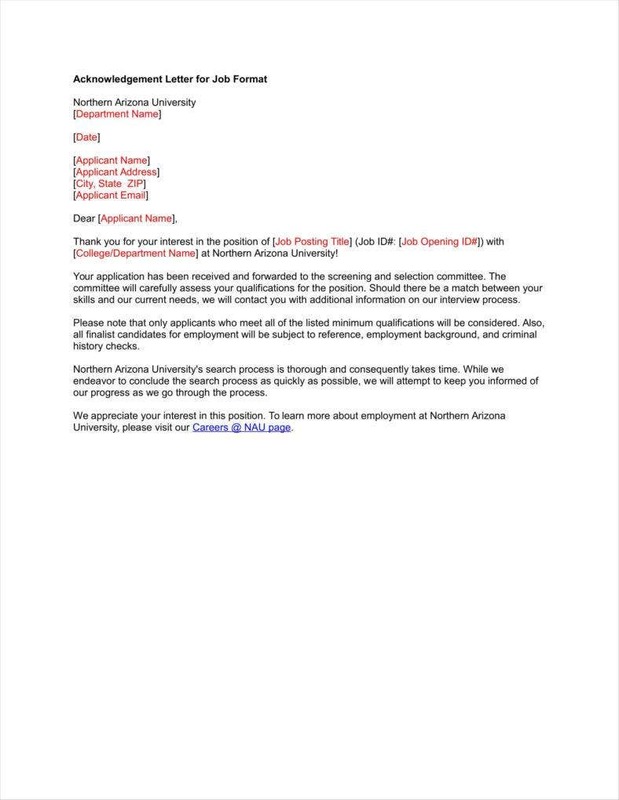 Also, remember that this type of letter doesn’t have to be made and given out by educational institutions only. It can also be done by government sectors that run educational programs, as well as nonprofit organizations and individuals that wish to contribute funds to further the studies of a particular student. Grievance application acknowledgement letters are made by those with authority in the event that they receive a complaint from anyone. Grievance application acknowledgement letters are written to ensure the recipient that the complaint is being looked into. The letter should also place a specific time period of when the recipient should expect a solution to the problem. It should also state that the type of resolution will all depend on the result of the assessment. If you would like to know more about how to use and write down acknowledgement letters, then you may go through any of our available articles to help you get the information that you need.